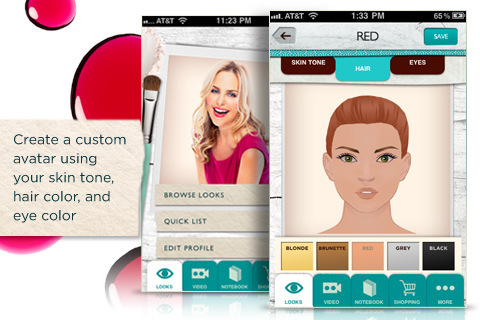 Make-up artist Carmindy, of TLC’s What Not to Wear fame, has released an iPhone app for those who want carry a bit of the make-up guru around with them at all times. Whether you’re just heading out for a quick spin around town or getting ready for the most important day of your life, Carmindy’s got a few tips and tricks hidden up her sleeve–some of which she divulges in her self-titled app. A profile can be made upon the initial launch: choose between shades of skin tone, hair, and eyes. This custom avatar creator can be used to tailor the eight Carmindy Looks to your own face. Under the Looks tab, you can either Browse Looks or see a Quick List; Browse Looks will show you a preview of the finished face (swipe to change Looks), while Quick List has all the Looks listed for easy access. Double tap any preview face for details, such as the steps involved and the products used to create the Look. Any of the products can be added to your Shopping cart; Carmindy helpfully divides most products into two categories, one for the cost-efficient and the other for those who are free to splurge. Tap the Shopping tab at the bottom once you’re finished adding to your cart to see the entire list. If you go back to a detailed Browse Looks page, you can also access videos or write notes concerning the Look, take a photo of yourself (if applicable), or share the Look through email, Facebook, or Twitter. All 16 exclusive videos can be accessed with the Video tab as well, and are separated into Tips & Techniques and Inspiration. All you need is an Internet connection in order to download the short videos; tap to begin the download, and again to start the film once the status bar indicates that it has fully downloaded. The Notebook, on the next tab, can be used to jot down notes to yourself about any of the Looks (these can be sorted by Look or by date), access Carmindy’s Twitter posts, or view all the pictures you’ve uploaded. Carmindy’s app is pretty perfect for someone who is just learning to apply make-up. The tutorials are straight-forward, and the videos are extremely helpful (in fact, I wish there were video clips for all the steps to the Looks, as monstrous as that would make the app). Some people didn’t like that the clips were so short, but I found them a great length in terms of downloading. Any clip over one minute was noticeably lagging. However, most of the videos and tutorials would probably frustrate anybody looking for elaborate looks or more advanced techniques. Since they are relatively simple, they should be easy enough to master, thereby rendering the app pretty much useless. As such, I really hope this app gets updates frequently enough to justify the $4.99 price tag. Otherwise, you could probably pick up these techniques elsewhere–Youtube, for instance, has an extremely healthy make-up tutorial culture. Carmindy’s make-up app is pretty and shiny and unarguably beneficial, but unless there is more content or a good sale price, I would wait on acquiring it. AppSafari review of Carmindy was written by Julie Guan on April 27th, 2011 and categorized under App Store, Education, Health, Homes, Shopping. Page viewed 5554 times, 3 so far today. Need help on using these apps? Please read the Help Page.